Hey, gems! We’ve made some updates to keep your experience sparkling. Thanks, as always, for playing. Published: 2013-07-02, by Ana Gracia. 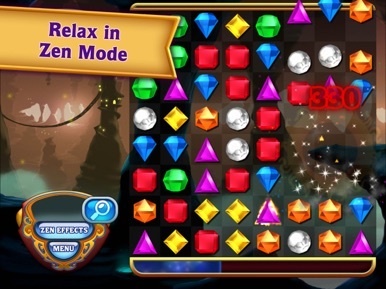 Bejeweled is a popular puzzle game featuring color jewels where you need to match three or more of the same color and witness beautiful effects with the power-up gems like: flame, star and hypercubes. Tap and slide the gems so as to move them and match them, trying to create combos at all times so as to get a higher score. Also, get help from the hint button whenever you get stuck and don't forget you only have 60 seconds to match as many gems as possible. As you keep playing, you will be able to unlock new features. The graphics are smooth and impressive, the game is really fun and its addiction powers make up for the lack of originality in both the idea and gameplay. You can play for a long time and still have fun matching and exploding gems and using power-ups to increase your score. 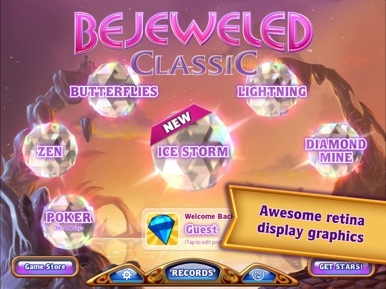 PopCap is the developer of Bejeweled Blitz and the premium version for iOS. An elegant app, well-designed and with an engaging gameplay for all ages, you won't mind if you've already played it a thousand times. 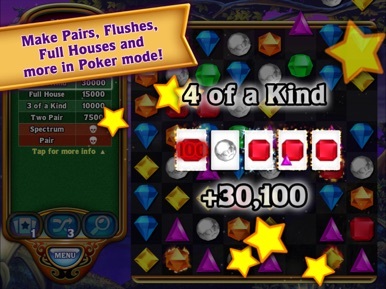 Discover your perfect match with 6 breathtaking modes in this classic gem-matching game, from the fast-paced, time-based Lightning, to the gem-driven Flushes and Full Houses of Poker Mode. Create electrifying special gems like Flame gems, Star gems, Hypercubes, and Supernova gems, collect flashy Bejeweled badges and achievements, and soar to dazzling heights in the Game Center leaderboards – all while enjoying fantastic Retina-display graphics! This is the Bejeweled you’ve loved for years, and it’s still delivering amazing high-carat excitement! Play the most popular puzzle game of the century with powerful new gems. You’ll find cascades of fun as you test your gem-swapping ability! Enjoy the original in Classic, race against time in Lightning, dig deep for treasure in Diamond Mine, discover your own relaxing retreat in Zen, match gems to save Butterflies from a hungry spider in Butterfly, keep the cold out in Ice Storm, and make top hands with gems in Poker. Each mode has two Boosts, one regular and one Super Boost, which help you make even more matches and set even higher scores. Whether it’s pulling all the Butterflies to the bottom row with Reset in Butterfly mode or shuffling the board in Classic mode, Boosts take your game to a whole new level! Earn flashy Bejeweled badges and Game Center achievements to prove your multifaceted skills, and compete against the world and your friends in Game Center leaderboards for the top score! Gloat over your scores for total matched gems, all-time best moves, and top 10 personal bests in Classic and Diamond Mine. Can't quite spot the next match? Use the "Hint" button for a quick tip. Stars mode will open a separate, free Bejeweled Stars App. Match and explode, be quick and use the power-ups to help you. Bejeweled is a popular puzzle game featuring color jewels where you need to match three or more of the same color and witness beautiful effects with the power-up gems like: flame, star and hypercubes. 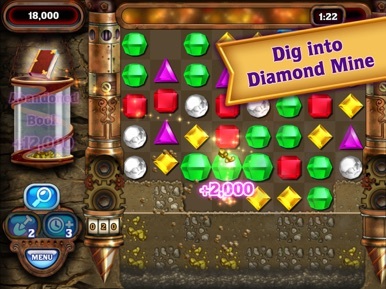 Tap and slide the gems so as to move them and match them, trying to create combos at a….